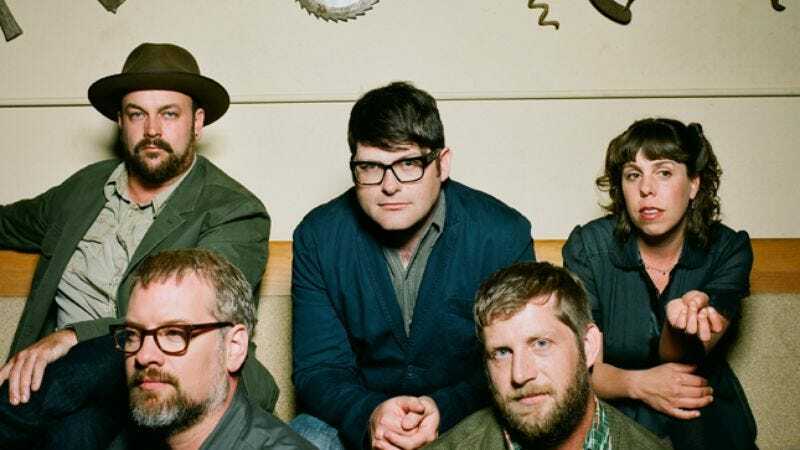 The patron saint of bespectacled lit critics who sometimes like to thrash, Colin Meloy has led The Decemberists through six albums of brainy, polysyllabic alt-rock. The group’s latest, The King Is Dead, is a considerable departure from 2009’s woozy, concept-heavy The Hazards Of Love: Recorded in a barn outside the band’s hometown of Portland, Oregon, it’s a country-tinged folk album that seems custom-built for an afternoon in the garden or a long evening on the porch. (Don’t panic: There are still plenty of delightfully nerdy bits, including a David Foster Wallace nod and a chorus built around the phrase “And the Andalusian tribes!”) Before The Decemberists and Best Coast play the Academy of Music Wednesday, The A.V. Club spoke to Meloy about the band’s change of direction, getting out of the studio, and how he feels about being a mouthpiece for English majors everywhere. The A.V. Club: How do you prepare yourself for going on tour? Colin Meloy: I try to enjoy every moment I can while I’m at home, and then I just patiently gird myself for the tour. There’s little else I can do. Performance, I love, but touring is probably my least favorite aspect of being a musician. And it’s weird, because some people are the opposite—that’s their favorite bit. That’s always surprising to me. I am a total homebody, so it’s a little jarring. But it’s part of the deal. AVC: Your band isn’t known for being especially loose, but this is a really loose-sounding record. CM: The thought initially was “Oh, we’ll just go into a barn and record it in two weeks.” But I think in the end, we wanted to do something a little more meticulous than that. That being said, a lot of it was recorded with us just sitting in a circle in the middle of a room in this barn. Inevitably, it has a looser feel. The songs themselves are a little bit more at ease than on prior records. AVC: Was this your first time recording in a barn? CM: It was. We did Picaresque in a church—or a church-turned-community-center—in Portland. The last several records, we did at various studios around town, and while obviously studios are versatile—that’s what they’re designed and set up for, and there are a lot of tools at your disposal—there is something weirdly sterile about them. Not literally sterile, because studios are rarely sterile, they’re anything but. [Laughs.] But there’s something institutional about the process. There are studio managers and studio owners, and you’re renting equipment, and the clock is ticking, and there was a band there before you, and there’s a band coming in after you. It can feel a little impersonal. The appeal of going to a barn or a church or any unconventional and neutral space is turning it into your own creative space. You’re connected to the space in a way that you wouldn’t be in a studio. And it’s such a crazy time—you’re spending 10 hours a day just in this room, working intently. You develop a relationship with the room itself; the room becomes part of the process, in a way. Being mindful of that, we thought it would be cool to be in a barn. This music is driven by a lot of pastoral themes, so if we were going to have a relationship with a space, we knew it should be somewhat rural. AVC: There’s an obvious country influence here. Do you listen to a lot of country music? AVC: There’s also a way West Coast artists do country—with Gram Parsons and the Bakersfield players being the primary examples—that’s more cosmic, almost spiritual. It’s very playful, very easy. CM: Yeah. If we’re playing any kind of country, it’s decidedly West Coast. AVC: A lot of Decemberists records are considered concept records—is there an overarching through-line here? Or did you deliberately want to break from that? CM: It’s a break. It’s not necessarily a huge break—The Hazards Of Love and The Tain are the only two things we’ve done that have a consistent narrative through the whole thing. The Crane Wife gets called a concept record a lot. It has those three songs, and they’re connected and spread across the record, but it’s not really a concept record. This one is more in keeping with our first couple of releases. And like with any record, I think that even if there’s not a narrative, there’s a through-line—like any collection of short stories should have something that connects it all together, even if it’s something intangible, like a mood or a tone. And I think that’s what’s happening with this record. While there’s no concrete narrative drawing everything together, hopefully people will pick up on a tone. AVC: The idea of a record being a collection of songs with a consistent through-line—that’s a struggling notion these days. CM: Having grown up listening and loving records from start to finish, I’ll never be able to divorce myself from that idea. I love the concept of really poring over a record and experiencing it from start to finish, picking up on the troughs and the high points and where they were placed in relation to everything else. AVC: On your website, you’re offering a $165 deluxe version of The King Is Dead that comes with a hardcover book and original artwork. Do you ever mourn the end of music as a physical, collectible object? AVC: Your lyrics tend to focus on old-fashioned, archaic things. I was a little struck to hear you reference a chewable Ambien tab. CM: [Laughs.] Yeah, “Calamity Song” is kind of my end-of-times destruction song. At the time, I was reading Infinite Jest, the David Foster Wallace book. That’s a nod to David Foster Wallace, since in Infinite Jest, time is subsidized. So that’s my version of what kind of corporation would subsidize that year—the year where everything ended. AVC: Speaking of references—is the title an homage to The Smiths? CM: I think that’s something you should work out. [Laughs.] You should meditate on that. Whatever decision you make is the correct decision. AVC: Coy! Peter Buck plays on three tracks. Coming of age in the late ’80s, was R.E.M. a formative presence for you? CM: Oh, absolutely. Hearing R.E.M. for the first time was as much of a watershed moment as anything else that’s happened for me, creatively, in my life. My uncle, who was in college in Eugene, sent me a tape of this local band that he really liked, and he had some space at the end of Side B. And he put on R.E.M.’s “Superman,” The Replacements’ “I Will Dare,” Hüsker Dü’s “Hardly Getting Over It,” and I think a Guadalcanal Diary song, and [The Smiths’] “The Queen Is Dead.” I think those five songs probably changed my headspace and the way I thought not only about music, but about being a creative person—I think it changed things completely. From that point on, I found a musical identity that I really loved. AVC: It’s a sign of a pretty good mix if you still remember all five songs in running order. CM: They’re imprinted on my brain! AVC: How did you meet Peter Buck and decide to collaborate? CM: He’s kind of a Pacific Northwesterner these days. I think he splits his time between Seattle and Portland. He’s in The Minus 5 with Scott McCaughey, who’s a local man about town who we rub elbows with. And he’s in Robyn Hitchcock’s band, The Venus 3, and they came out and did some dates with us on the Hazards Of Love tour. So we’ve crossed paths quite a bit. And each time we hang out with him, I don’t stop expressing my undying love for his guitar-playing. I mentioned that I was writing some songs that had fake Peter Buck riffs, and I thought maybe he would think it was funny to come and play them. And he did, and he was very kind. CM: I was nervous, but knowing him—he’s an incredibly sweet guy. I think he got a kick out of it, and he was happy to humor us. But certainly I was nervous about it. AVC: Gillian Welch and Dave Rawlings also guest. CM: We’d known Gillian and Dave for a while, just from tours. They came out to a show in Nashville and played a few songs with us onstage. They’re diehard Robyn Hitchcock fans, and we actually spent a couple hours after the show just trading a guitar back and forth and playing every Robyn Hitchcock song we knew. I think there was a real connection there. For The King Is Dead, Tucker [Martine] and I had this idea that since they’re country-rock songs, we should have a male and female voice. That’s really common in some of my favorite records of that genre. So we wanted a male and female voice, and we wanted to mix it really high, so it’s almost a duet. But we needed to find someone with a really distinctive voice. Gillian was the first person who came to mind. Thankfully, she was available and interested. AVC: I read that you recently moved outside of Portland to a more rural area. Why did you decide to leave the city? CM: I don’t know, I think we just wanted a change. It was as much my wife’s idea as it was mine. It’s not like we were in the middle of the city—you know, the thrum of the city streets!—but we were in a busier neighborhood, and closer to downtown. We started looking around, and we found this house in this teeny neighborhood tucked up on a hill, inside Forest Park, which is a 5,000-acre city park in Portland. We loved the house and loved the area, and we went for it. I think that move influenced and informed a lot of the songs on the record. AVC: There’s certainly a woodsy feeling to these songs. CM: I think that was a natural reaction just to being somewhere new. You do kind of take stock of what’s going on around you, and that was such a new environment. Thankfully, I had some down time between tours and was able to get to know the area and the flora and the fauna. Invariably, that made its way into the songs. AVC: You’ve spoken before about how the meanings of some of the words you use are peripheral to the rhythm of the language. Are there other songwriters you admire who are doing similar work? CM: I think it’s pretty common—any songwriter is really playing off the rhythm and the meter of the language itself. I think of Joanna Newsom as someone who really uses a lot of flourishes—she uses language because of the poetry of the words. But I really think the words themselves should work in the context of the song. When you’re writing a song, you’re using language and the voice as an instrument, so the way they play off the melody and the meter of the line is really important. And while some of the words might seem out of place in a pop song, I don’t necessarily think of them as being overly strange or obscure words. AVC: The Decemberists are always described as literary. Does that frustrate you? CM: Yeah, we get described often as a “literate rock band.” Which I guess is better than being called an illiterate rock band, because in fact we can all read. But yeah, I’ll take that. That’s fine. It’s English-major rock. I’ll wear that on my sleeve.